Mastering the art of flying was a huge feat for the human race, and an amazing accomplishment. It took intuition and engineering to interpret the methods by which flying animals engage in flight and put them together into mechanisms that allow humans to travel through the air for extended periods of time. After the first flying machines, which constantly had to be generating thrust to sustain flight, other modes of flying became intriguing to humans, hovering, for example. 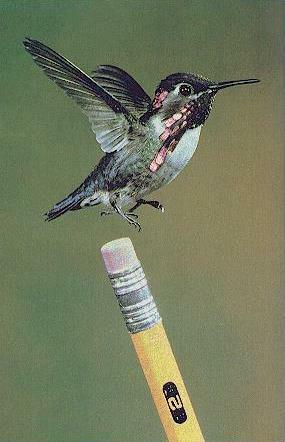 One of the best, if not the best, hovering creatures on this earth is the hummingbird. But how can they engage in such an astounding act? How can these little creatures create the forces necessary to maintain airborne with no lateral or vertical motion? Read on! weighs about 20 grams. So there is a lot of variance in the sizes of hummingbirds, but they all have the same flight patterns. What are these flight patterns. you ask? Hummingbirds engage in impressive wing strokes in which lift is generated in both the upstroke and the down stroke. Most birds can only produce lift in the down stroke, using the upstroke merely for recovery. 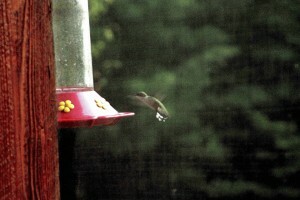 But most birds do not have the same agile wings as a hummingbird. 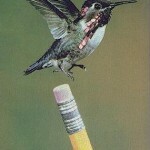 During flapping, 75% of a hummingbird’s weight is supported by the down stroke, while 25% is supported by the upstroke. Most other birds are completely supported by the down stroke. So let’s get to talking about how both phases of the wing beat support the bird’s weight. As a whole, the flapping of wings is a figure-8 motion. The wings tilt forward and down on the down stroke, and then twist over to point backwards and up in the upstroke. This impressive twist is a result of flexible shoulders. 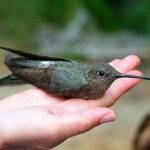 The twist is also what allows the upstroke to produce a force of lift on the hummingbird so it doesn’t lose height when it is not in the down stroke. Lift is produced by the relative airflow to the moving wing. Any other avian species would generate no lift during the upstroke because it cannot twist its wings to reverse the camber and, essentially, the relative airflow. 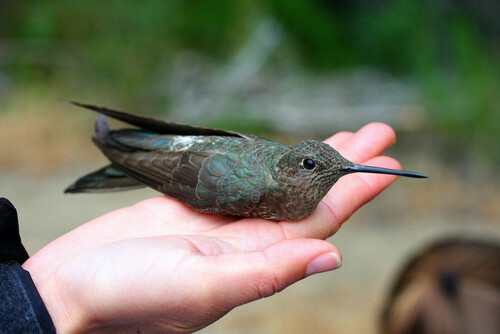 The reversed camber in a hummingbird’s upstroke is a defining characteristic in the wing beat, giving the bird an upwards, rather than downwards, relative airflow, this is the lift that holds 25% of the bird’s weight when hovering. Click the link below to watch a hovering hummingbird and observe the motions of its wings. Photo 1: I took that photo.